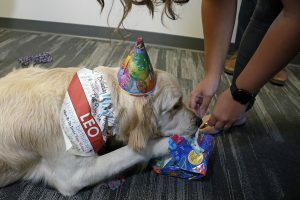 I haven’t been to many dog birthday parties (Ok I haven’t been to any), but I think Leo had the best birthday party ever! We, of course, showered him with love and attention from the moment we woke up, and by the time we were leaving, Leo knew something was up. 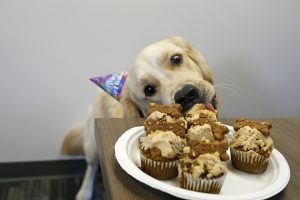 It probably helps that I was carrying yummy smelling (homemade) pupcakes and people cupcakes. 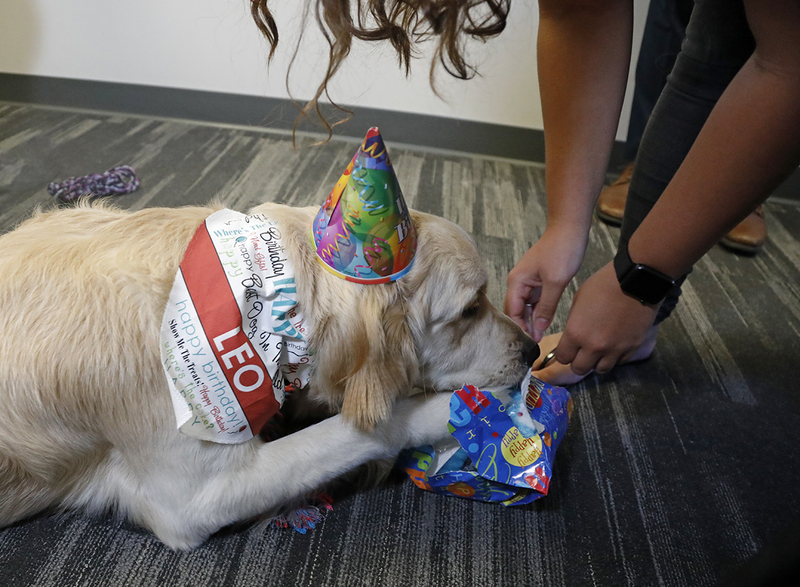 We got to work early because I wanted to set up the decorations, but as the morning came and went, Leo had SO many visitors coming to tell him “Happy Birthday” accompanied with plenty of extra scratches behind the ear. He even got to play with his best bud Asher! 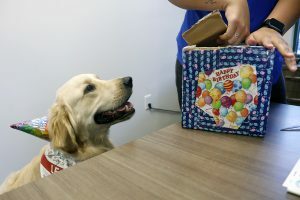 At lunch time, Leo got to open all of his presents and he was overwhelmed with excitement at all of his new toys and the fact that he finally got to have one of those yummy smelling pupcakes! 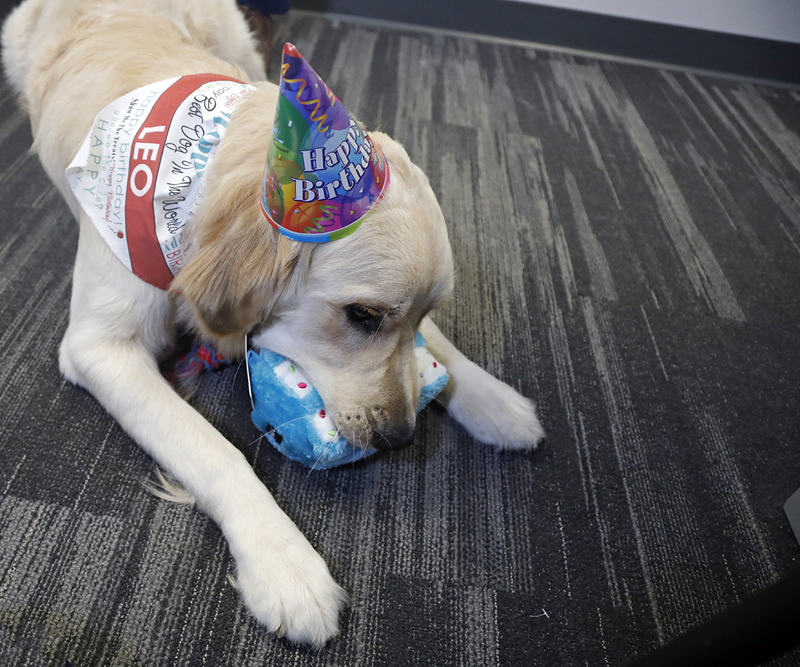 Leo even paraded his new toys around and showed everyone what he got. He was so tired at the end of the day from all the excitement and extra attention. As soon as we got home he laid down sploot-style and took a long, hard-earned nap…until dinner time, of course. 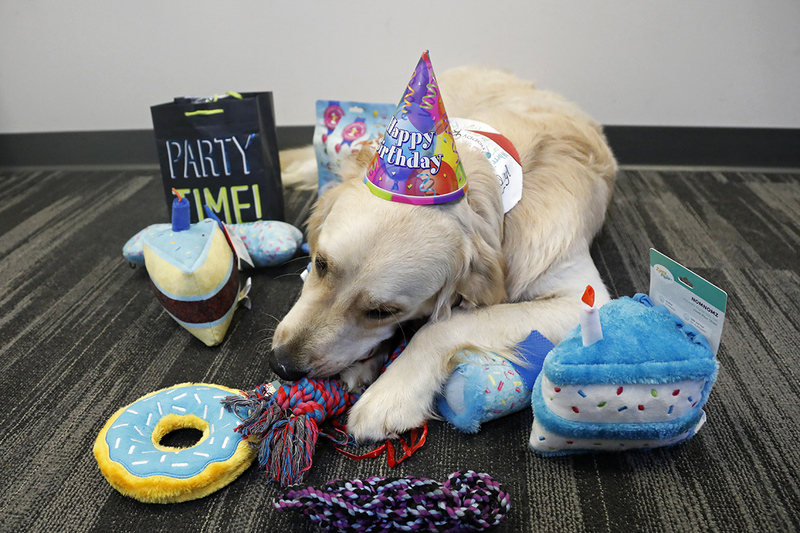 Happy Bday big boy, what a great party, so many treats and gifts. wow, you scored big time ! i hope that you have a wonderful 1 yr Bday and many more healthy happies. you got some great parents who love to spoil you. 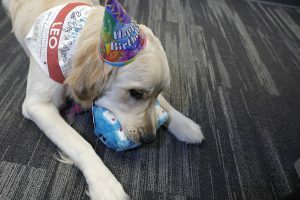 Happy Birthday Leo! You had a wonderful party! Those doggy cupcakes was the special part of the day! Look like you enjoyed them the most! 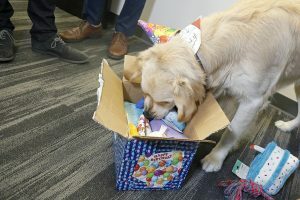 Our Harry and Ace send tail wags acknowledging that your birthday sure looks like lots of fun. May you have many more happy birthdays! 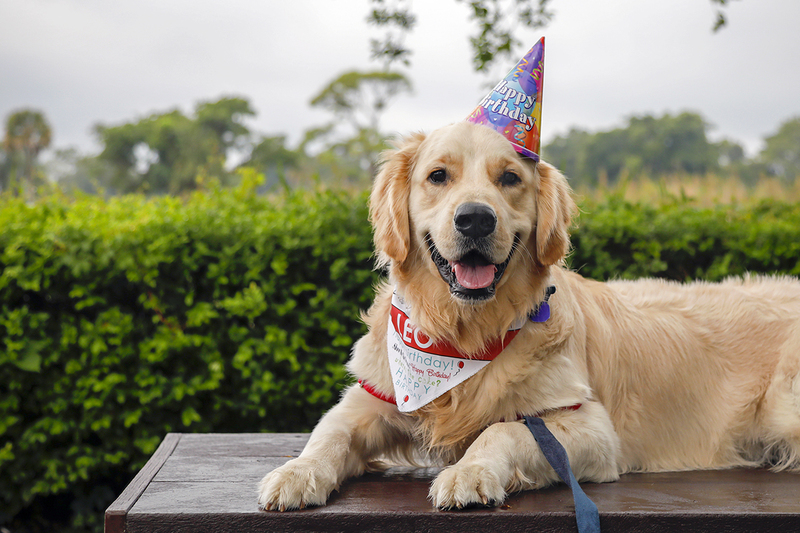 Happy Birthday Leo! 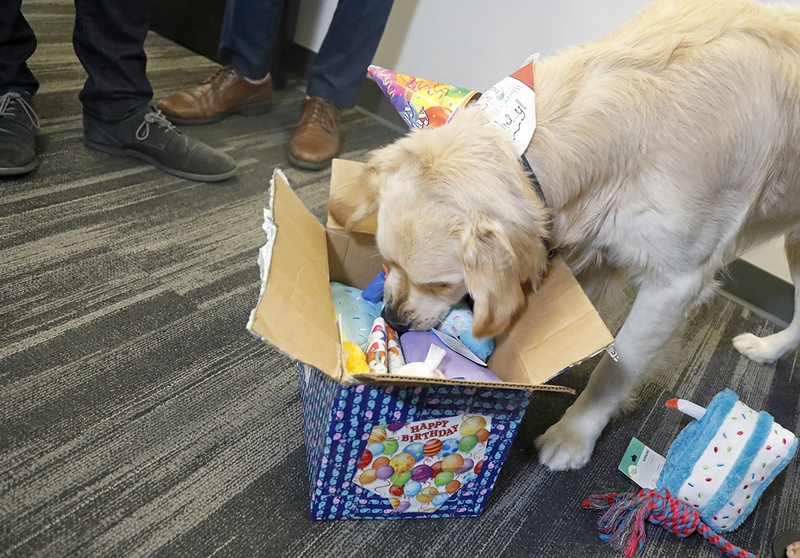 Now you know what a birthday…and presents…are all about. You will have one every year & your pet parents will be showering you with love & attention on your special day. May you have a long, happy, & healthy life ahead of you!